These minimally invasive injectables restore youthful volume and fullness lost in the aging process. They are mainly used in the mid to lower face for smoothing wrinkles, defining contours and enhancing lips, often in a single treatment. There are many options to choose from depending on target area, aesthetic goals and lifestyle. Juvederm is the first and only FDA-approved hyaluronic filler used to smooth wrinkles around the nose and mouth for up to 1 year. By replacing our body’s naturally occurring hyaluronic acid lost to age, Juvederm restores a key support substance that plumps and hydrates skin. Patients see significant improvement with hyaluronic gel products like Juvederm, which are naturally absorbed back into the body. 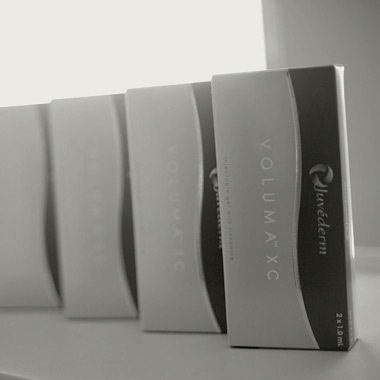 New and highly popular, Voluma is unlike any other filler we carry. It’s the first FDA-approved hyaluronic gel for the mid-face – not just lines and folds, but major areas requiring substantial volume replacement for ideal results. It instantly improves fullness in the cheek area, creating contour and subtle lift with natural looking results that last up to 2 years. Restylane is similar to Juvederm as a hyaluronic gel, but has a slightly firmer consistency, often preferred in the lip area. Its effect lasts up to 6 months. Since its introduction, the Restylane product family has expanded with alternate formulas, like Restylane Silk and Perlane, for specific applications. Restylane Lyft is a hyaluronic filler that produces dramatic results in areas of the midface that have lost significant volume. This trusted formula was formerly known as Perlane-L and is used to correct deep wrinkles around the nose and mouth. Recently, the FDA approved the product for lifting the midface and building cheek volume, as well. Its remarkable smoothing and plumping effect is the result of particles injected deep beneath the skin’s surface, supporting from within. Restylane Silk stands out as the first and only FDA-approved hyaluronic gel filler developed exclusively for the lips and lines around them. This formula consists of smaller, smoother particles, and requires an ultra-fine injection for precision. The results are impressive, yet subtle – exactly what patients aim to achieve in lip enhancement. Radiesse achieves fabulous effects as an FDA-approved filler for severe lines and deep wrinkles. Its active ingredient, calcium hydroxyapatite, is proven to stimulate the body’s own collagen production and is metabolized naturally. Another advantage: results that last for up to 1 year in most patients. 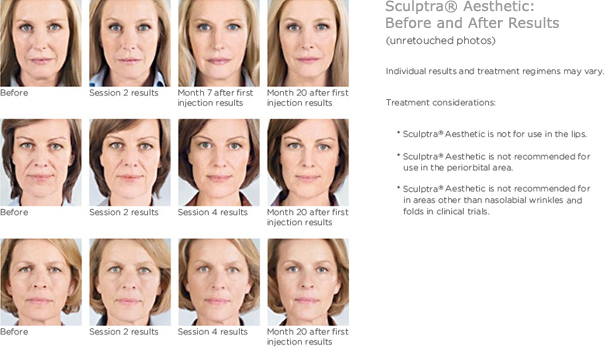 Sculptra differs from other fillers in its ability to gradually achieve long-term smoothness and volume through a series of multiple injections. It primarily targets deep facial wrinkles around the nose and mouth. A full treatment of 3 sessions over a few months can yield effects lasting up to 2 years. Patients enjoy major, yet discreet improvements in smoothness and wrinkle reduction.